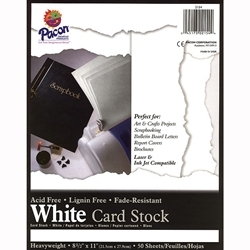 Pacon White Card Stock Pack of 100 each - 8-1/2 x 11 inch - This card stock is perfect for art & craft projects, scrapbooking, bulletin boards, report covers, brochures- anything you can dream of! Laser and ink jet compatible, acid free, lignin free, fade-resistant paper. Measures 8-1/2"x11". The sheets are approximately 70lb in weight, and there are 100 sheets per package.